We deliver innovative education programmes, some of them in partnership with others, some of them off-site and others at The Academy. The delivery style and teaching philosophy behind our education programmes is under-pinned by our ‘building a bridge of trust’ model, when working with the young people we support. The Alternative School provides young people who are at risk of exclusion from mainstream education or who may find school a challenge, an alternative place to learn, grow and develop. Students attend the Alternative School three or four times per week. Their development journey includes 1:1 support on subjects including Maths and English in addition to physical activity sessions. There is a focus on self-reflection, personal development and fostering a growth mindset. Our 'free to choose' options emphasise practical learning through volunteering and work experience opportunities. Every young person is mentored by one of our youth workers or community coaches. All the young people who left our school in 2018 did so with a N4 English or N5 Literacy and all achieved a Maths qualification relevant to their level of ability be that N3 or N4. All leavers are on a path to positive destinations via Activity Agreements, Apprenticeships, College or Full time employment. In session 2018/19 we are set to work with at least 16 young people following the tremendous successes in 2017/18. The Academy’s youth workers are based in local primary schools for one full day a week where they mentor young people who need extra academic, social or emotional support. Youth workers are valued members of school staff, communicating the same core messages to pupils but their connection to The Academy means that young people often feel more comfortable approaching them when they need help or support. Our homework clubs are delivered in local primary schools with the help of volunteers from local organisations. Pupils enjoy homework support that may not be available at home, and physical activity in our 'game of two halves' approach. This term we have more than 100 pupils from four local primary schools taking part in Homework Clubs. Ciara from Castle Rock Edinvar helping out at Pirniehall Primary School. Spartans Smilers is our oral health programme for Primary 3 pupils. 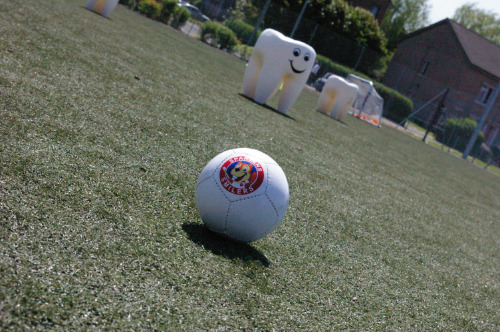 It uses football to teach children the importance of dental health and oral hygiene. The programme features an e-learning module including a practical and fun football session where our community football coaching team will reinforce oral health messages. If you are interested in delivering Spartans Smilers at your school please contact Kenny Cameron. In partnership with the Scottish Football Association we deliver the 'School of Football' programme at Craigroyston Community High School. Football is used as a vehicle to inspire and motivate pupils who are facing challenges at school. The Academy's community coaches deliver lunchtime, after-school and curriculum football-based PE sessions in local primary schools. Whether it’s officiating a game in the playground or delivering curriculum sessions, we aim to inspire and motivate pupils to be physically active and develop their social, teamwork and football skills in a safe and supportive environment. Gofitba is a football based health and wellbeing project that we deliver in partnership with the Scottish Football Partnership Trust. The programme offers the young participants a chance to enjoy an hour of fun football-based activity led by club coaches, followed by an hour where they are taught how to lead a healthier lifestyle through diet and nutrition by completing their very own learning journal. To round off each weekly session, the kids are then served a hot healthy meal which gives them an opportunity to enjoy some social time together. Our Youth Ambassadors Programme welcomes young people who would like to gain valuable skills and experience in youth work, facilities management and coaching. Participants are mentored by staff from The Academy and work towards their national Saltire Awards.